The No. 10 Hawkeyes have traveled east to face Illinois for the second Saturday in a row, this time heading down to Champaign after both teams just faced off at the Windy City Invite. Illinois came out victorious there while also taking four event titles, and Iowa placed fourth with 10 top-10 finishes. Illinois comes into today as the easy favorite, having a team high score 10 points higher than Iowa’s debut score last weekend, but this is gymnastics and anything can happen. Last year, Iowa beat both Minnesota and Penn State in regular season meets, showing that the Hawkeyes are capable of pulling off surprise upsets when their foes aren’t hitting. The Illini are ranked in the top eight on every event, peaking at No. 3 on vault just ahead of their two No. 4-rankings on pommel horse and rings. Iowa ranks in the top 10 on four events—with pommel horse and vault the exceptions—and outrank Illinois on high bar with its No. 3 position. 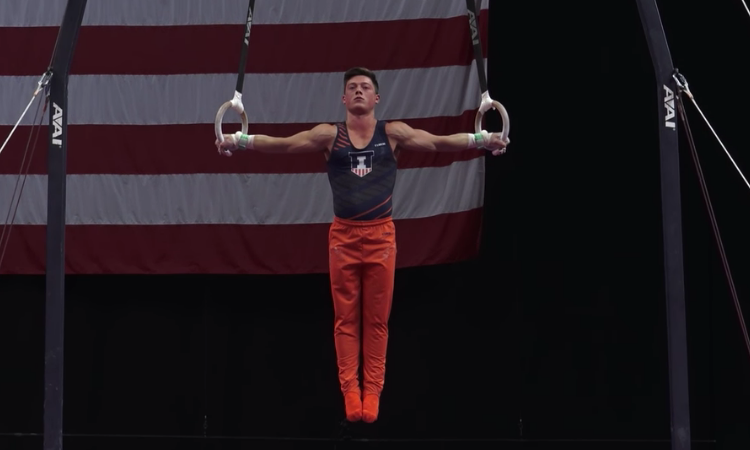 Illinois is led by senior Alex Diab who is ranked in the top 10 on floor and vault while holding the top ranking on rings, the event he won at NCAA championships last season. Although he holds the top ranking on rings, Oklahoma’s Yul Moldauer posted the highest score of the young season on the event last weekend, so watch for Diab to try and best his career high yet again this season to retake top score honors. Also watch for junior Michael Paradise, the second ranked gymnast in the nation on pommel horse, and Clay Mason Stephens, the current Big Ten freshman of the week. As stated earlier, Iowa’s best event is high bar, where it is the only school in the country with four gymnasts ranked in the top 20. 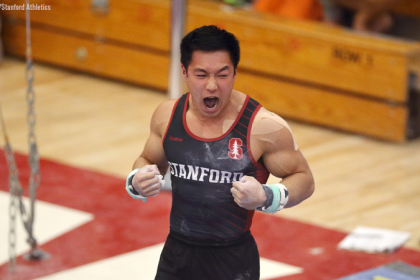 Bennet Huang, the nation’s 14th ranked all arounder, also boasts top 20 rankings on floor and pommel horse, the highest on the team on those events. With Big Ten regular season matchups counting now counting toward the Big Ten regular season championship title, the Hawkeyes will need to step up from their performance last week to be able to contend with the Illini tonight. Follow along with scores and on the stream! We’ve got some club teams competing here tonight as well, so notice that the teams aren’t rotating in the traditional dual meet format. Hopefully they show routines on the stream in dual meet fashion though so we don’t miss anything! Looks like we’ve got Huang as the only all arounder tonight for Iowa, while Illinois has Jacobson and Stephens based on the tweeted lineups from both teams. Diab going sub-14 on an otherwise solid floor rotation hurts a little bit since we all know he’s capable of much more. Illinois is going to have to keep it up if it wants to hit the big scores the other Big Ten schools put up earlier today. Iowa did its job on pommel horse, only having to count one routine in the 12’s. It’s also four points better than the Hawkeyes did on the event last week at Windy City so that’s huge for them. Both events were improvements for both teams compared to last week. Iowa by a few tenths and Illinois by about a point. Illinois’ pommel horse rotation suffered from a few form breaks but Paradise’s huge score in the anchor spot is huge for the Illini. They’re currently on pace to beat their score from Windy City, as is Iowa despite a miss from Wong on rings. Brodarzon came up big as the Hawkeyes anchor on rings but they are still looking for their first routine to break the 14.000 barrier. Illinois is starting to figure out these landings! Iowa a casual four point improvement on vault from last week. A couple of them nailed those landings, and it showed. Illinois left a little to be desired with some form issues on rings, but Alex Diab came up big in the anchor spot for the Illini, seemingly the theme for them through the first half of this meet. 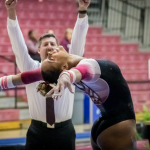 Illinois is on pace for a great score, but with arguable its three best events over with, the vault score will need to be huge to compensate for the lower scores the Illini tend to get on parallel and high bars. 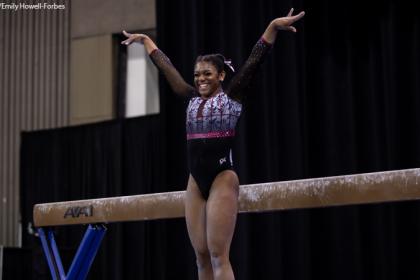 Parallel bars is one of Iowa’s weakest events, but the Hawkeyes muscled through to improve upon their score from Windy City despite a few misses. Without those errors the score will improve drastically. Illinois killed it on vault. Nothing exceptionally flashy, just super clean form and only minimal landing deductions. Once those landings are consistently sticks the Illini will be dangerous there with their superb form. If Illinois wants to match the huge, and Big Ten leading, 413.150 that Michigan put up earlier today it needs to average 67.7 on it’s last two events. It’s doable, but the Illini only went 66 and 64 on these events last weekend. It’ll be a tough challenge. Not an ideal rotation for either team. Iowa missed a big opportunity on what is typically its best event with some misses and falls. Illinois hit the average target score to beat Michigan’s score on parallel bars, but with high bar being such a low scoring event a few extra tenths to a point would’ve done wonders. Besting Michigan’s score is out of the question now, unfortunately. Season highs by both teams! Iowa wasn’t able to pull off the upset tonight, which starts off Illinois at 1-0 and Iowa at 0-1 in the Big Ten regular season standings. Iowa had a much better showing tonight than its debut last weekend in Chicago, even with the sub-par high bar rotation. The Hawkeyes do need to find routines on events other than vault to break 14.000 to elevate their score to compete with the top teams. Illinois should also be pleased with its performance tonight with season highs on every event, even with the high bar mishaps. Jacobsen also won the all around with a respectable 81.950, showing that the Illini have lots of options on every event since he is one of two different Illini to take an all around title so far this season.